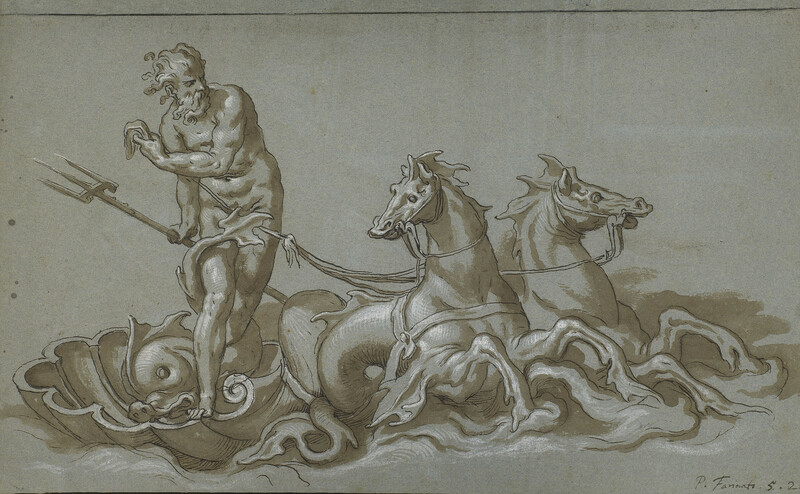 William Gibson's inscriptions and characteristic price codes can be found on 14 drawings by Paolo Farinati in the Royal Collection, including this sheet depicting Neptune, god of the sea. Farinati's works were very popular with seventeenth-century English collectors: his drawings were to be found in the collections of Nicholas Lanier and Peter Lely, and the entire album of Farinati drawings (including those with Gibson inscriptions) listed at Kensington Palace in 1727 is likely to have come from Charles II's collection. Following Jonathan Richardson the Elder's explanation of Gibson's pricing system whereby the second figure is the unit, with 1 representing a shilling, 2 for half a crown (2 1/2 shillings), 3 for a crown (5 shillings) and 4 for a pound (20 shillings), this drawing, with the price code 5.2. was priced at 5 half-crowns, or 12 1/2 shillings. Neptune was a popular subject for Farinati, featuring in several of his drawings and paintings. This particular depiction is not connected with a known painting, but a finished drawing such as this could have been used to demonstrate possible motifs to potential patrons, or a completed work to be collected in its own right.